​Monday, ​Major League Baseball began honoring ​Jackie Robinson with every player on every team wearing the No. 42, the only number retired by all 30 teams. MLB isn't the only entity recognizing Robinson, however, as Budweiser decided to partner with the league and run an ad that's intended to honor Jackie. 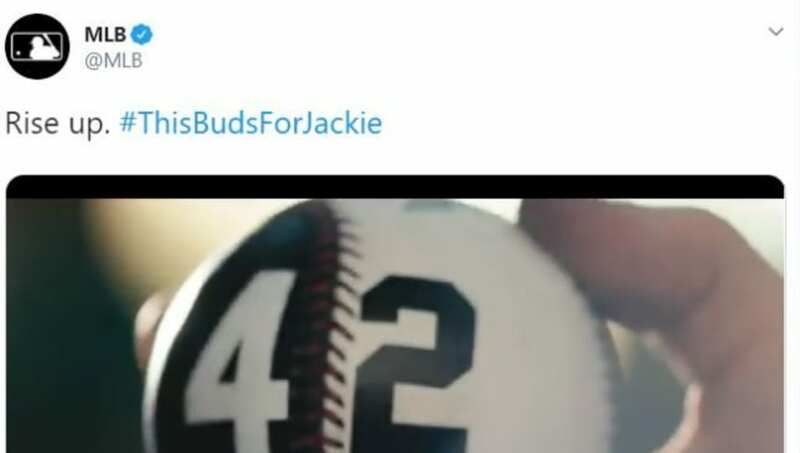 Major League Baseball decided to tweet this Budweiser commercial out with the hashtag "#ThisBudsForJackie" (yikes), and they are getting a ton of blow back. So much so, in fact, that they quickly deleted it. ​​We all know that Budweiser is one of the big sponsors for MLB, but have a feel. Did they honestly think using Jackie's likeness in a beer commercial was a smart thing to do? ​​In the end, it's all about making a profit, and if they can use Jackie to do so, they'll do it. There simply has to be a better way for major corporations to honor Jackie Robinson. "If he were alive today, we're sure he'd enjoy a nice, cool Budweiser" certainly isn't it.